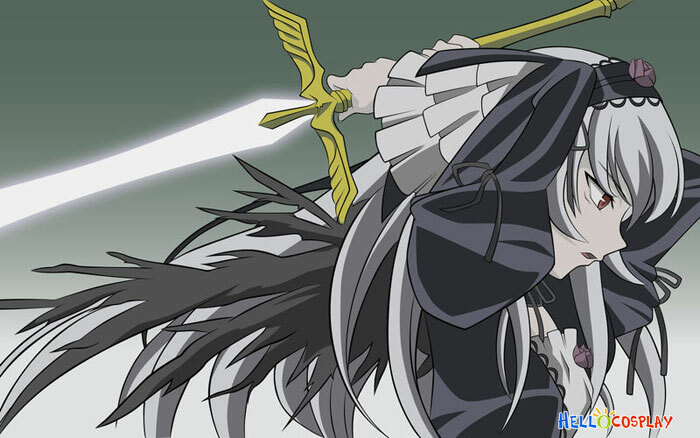 Sometime, that feels like ages ago, I was commisioned to build Suigintou's sword, from Rozen Maiden. I like making swords. 'Nuff said, movin on.. I made the blade out of pine, but I resent that I didn't have any harder wood at my disposal, as the blade is only 2cm wide for the most part, and hence, quite fragile. The tip&edges were shaped on a disksander, and refined further by hand. The curves ath the root ob the blade were Dremeled, though. ...And here n turn is pictured what I came up with. The handle was lathed with a custom, rigged together ghetto-lathe. I told my father about the lathing problemI had, and he told me that my grandfather once built a lathe out of scrap, but it was disassembled at some point. So I started looknig for the parts and piecing the machine back together, and behold, works like a charm. Then I started making some dust. The "wings" of the crossguard were first sawed to a rough shape with the bandsaw, and shape refined into finish with a lovely set of chisels, and finally finished with sandpaper. The wing in front is a nearly-finished, and the one on the back is rough-cut. Parts done so far mocked together in their places. At some point I painted the blade for some reason. The handle was primed, and I inserted a steel nail with the top cut off to secure it to the blade somepoint further along the way. The wings were to be sandwiched between two pieces of wood. There's a channel in the middle where the blade passes through. Mocked in place with the mightiest power in the universe, the G-clamp. The crossguard side pieces were dremeled to a rough shape. ...And crossguard glued together. At this point it and the blade weren't glued together yet. Some wood filler was used to blnd the pieces better together. Some 1cm x 1cm rod was sanded to form the "head" piece that rested on the blade. At the bottom, where the blade comes through is a hole to receive the al affixed to the handle. The curve to meet the round head of the handle was made by glopping on some filler, waiting for it to semi-harden, and squeezing the handle in place, and carefully removing in. Bam, perfect fit. After this, the only thing to do was paint. And finished. It's a very elegant sword. My prior experiences with gold paints has been pretty bad, but here it turned out great. The piece hasn't been polished at all. A detail shot of the "head". I intentionally left the wood grain visible on the blade, so that no con-security would consider this a real weapon after closer inspection. Upeaa jälkeä! Vaikka tämä olikin vähän unohtunut itseltäni, niin kiitos aivan suunnattomasti!